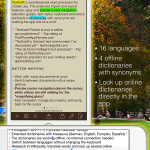 Textkraft Pocket offers all premium features and dictionaries for all languages without in-app purchases or other surcharges. 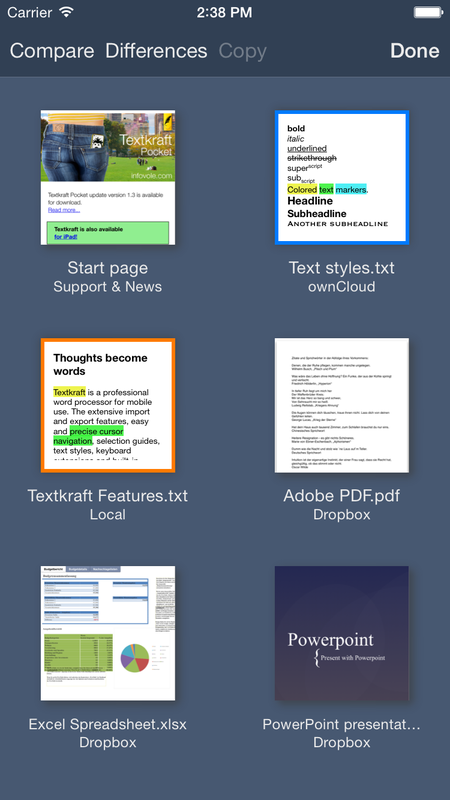 Textkraft is also available on the iPad. 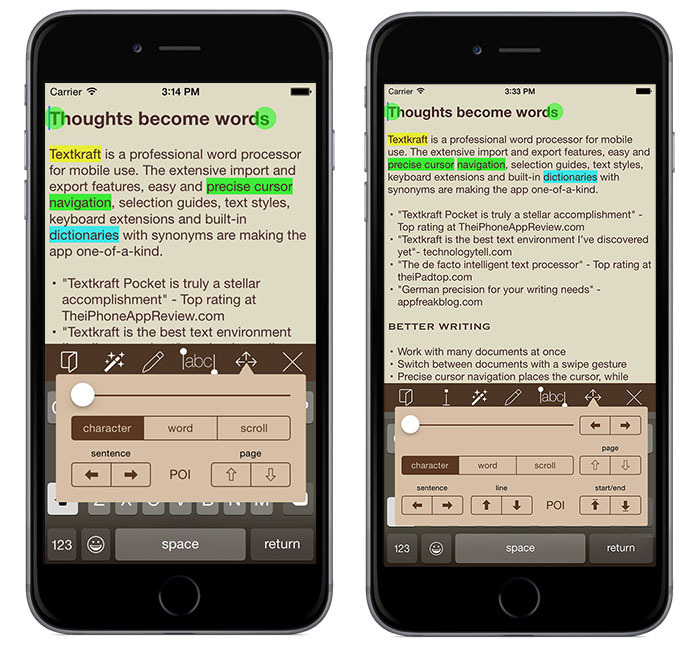 Learn more about Textkraft Professional. 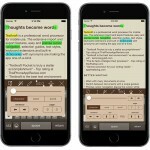 Textkraft Pocket is a professional writing app and document reader in one app. 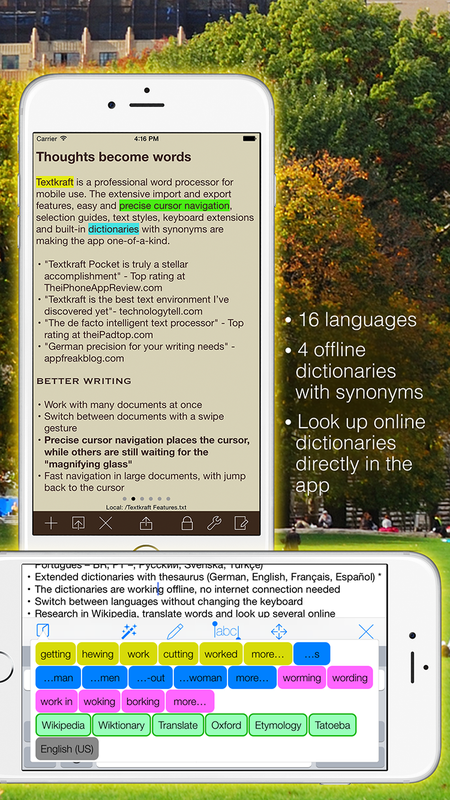 The extensive import and export features, easy and precise cursor navigation, selection guides, text styles, keyboard extensions and built-in dictionaries with synonyms are making the app one-of-a-kind. Precise cursor navigation places the cursor, while others are still waiting for the "magnifying glass"
Search & Replace toolbar. Replace uses the clipboard content. Use regular expressions for searching by prepending "grep:" to your search phrase. E.g. "grep:\t" searches tabs and "grep:[0-9]+" shows numbers of any size. Comprehensive VoiceOver support. 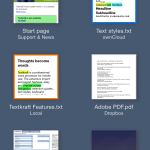 Read more about Textkraft for visually handicapped users. Important functions are available as key shortcuts on external keyboards. 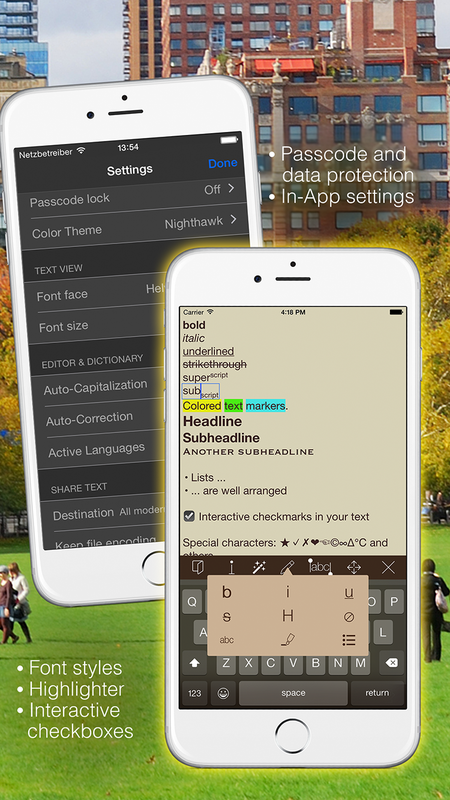 Use a prediction and correction menu directly in the text. 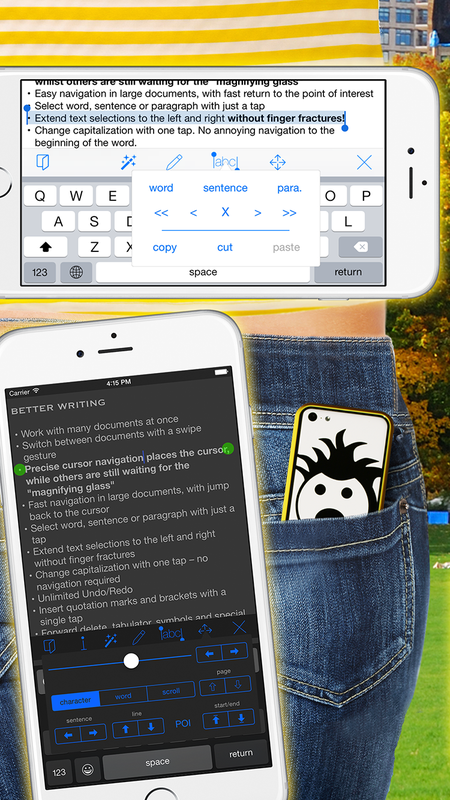 It only replaces words when you tap on them. 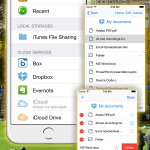 Copy and move files on your cloud or local storage without loading them! 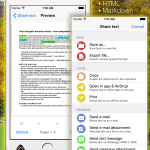 System wide Share Extension sends selected text from any app to Textkraft – without opening it. 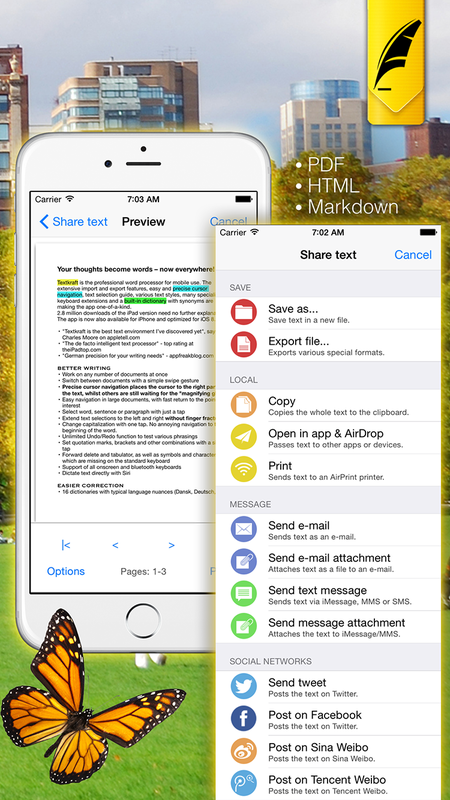 Collect text fragments during research quickly without switching apps back and forth. 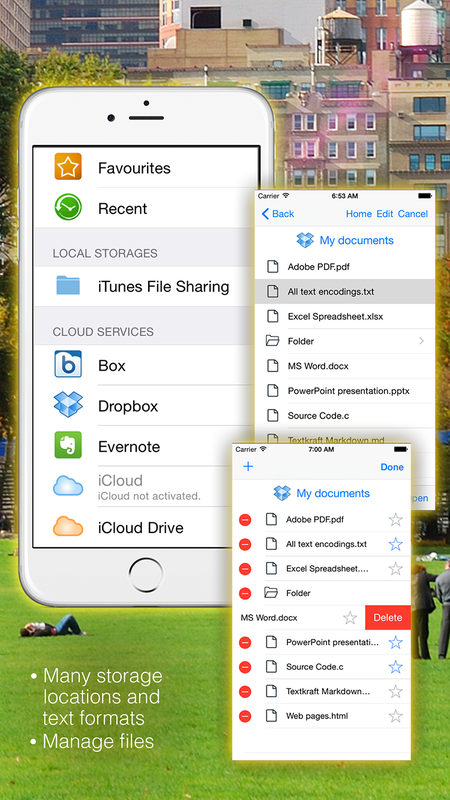 Texts can be saved in local storages. Textkraft does not force you to use a cloud service. ANTI-SPY GUARANTEE: infovole GmbH is committed to compliance with European data protection laws. Your documents are not evaluated, or made accessible to third parties or us.